I have something to ask about my blog post. Below are my screenshots showing that my blog post title is conflict with the recent post link. 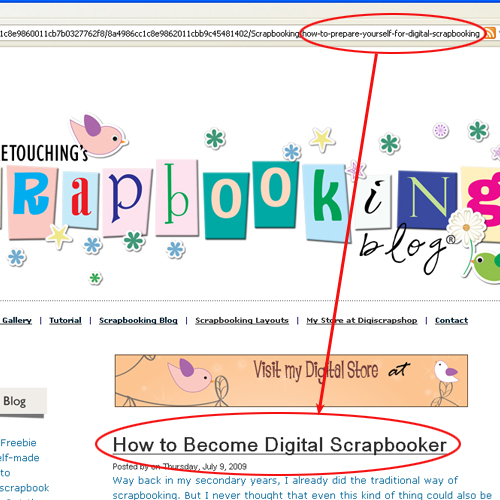 I edited this title from "How to Prepare Yourself in Digital Scrapbooking" title to "How to Become Digital Scrapbooker" and it was successfully changed, besides i used to do changing blog post title even before without having problem like this. My site is already been published and updated but the blog post link is still conflict. I already tried to refresh the page several times. I even tried to logout and login but still the same conflict appears. I placed the Recent Posts at the bottom most of the page so that you can see the real appearance of the link using the Recent Posts widget (..because i made my own Recent Posts tab), kindly take a look because what the title says is different from the title in the link at the browser, but it is directed to the blog post correctly when i click the link. I am so confused about it. How can i fix this conflict? I have asked our developers and they inform me that we recently instituted a change so that blogpost URL's are no longer changed when you edit your title. This prevents broken links to your blogposts. Both links will work and bring up the correct post, as Lee points out. A time stamp is added to the second one to ensure that each URL is unique. I hope this makes sense. Let us know if you have any further concerns.